With the UEFA 2012 European Football Championship kicking off in Poland and Ukraine, the eyes of the continent – as well as taking in the football skills on display -will focus on graphic design. Kit design and shirt typography are as constantly observed as the players and the game itself over the course of a tournament, even if subconsciously. Later, with hindsight, shirt design, typography, and occasionally materials and crest design, come to serve as a historic bookmark in the chapter of each competition. 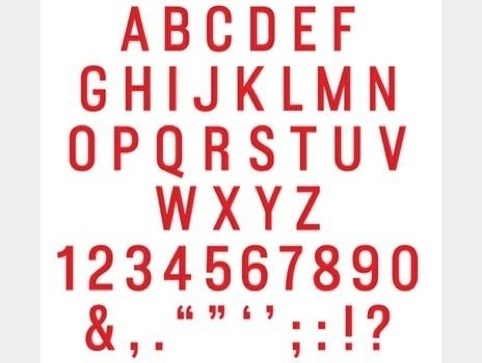 This European Championship will spotlight consultancy GBH’s campaign for Puma – a typography-led concept, based on a gaffer tape style font, known as gaffer, (as in The). As well as featuring in an ad campaign around the idea that football ‘Brings us together,’ the DIY font will adorn the very shirts worn by players. 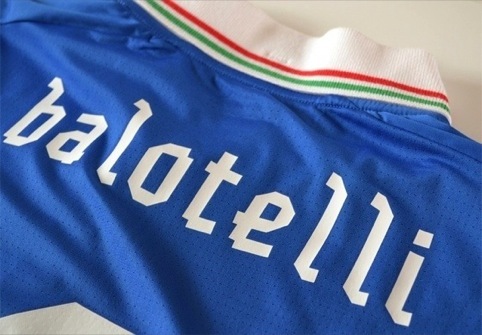 The Gaffer typeface is seen here on Italy’s shirt (it’s unlikely that this will be the last time a camera zooms in on referee-botherer Mario Balotelli). GBH created the Gaffer font by folding ripping and sticking gaffer tape before forming a full Roman alphabet and set of numerals. They used a painstaking 150 rolls of the stuff. 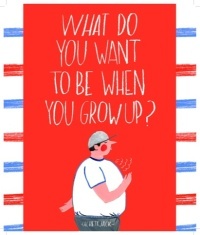 The consultancy worked with font studio Dalton Maag to develop a full character set, adding all European accents. England’s kit, designed by an Umbro team led by Rob Warner, was unveiled in March as a replacement for the Peter Saville-designed shirt, which was created with Commercial Type partner Paul Barnes. Barnes, without Saville, has also designed the type for the new shirt. ‘We tried to make something that had its roots in English lettering and type, particularly from the 19th-century when football became codified and the first international games were played,’ says Barnes. Inspiration was sought from pub and shop signs of the period and Barnes tried to recreate effects such as making letters appear three dimensional while actually being flat. ‘By creating the letter from two tones, it also reflects the stripes in the collar and cuff areas,’ says Barnes. Barnes conducted research at the St Bride Library on London’s Fleet Street, looking at wood letter specimens made for posters and billboards. ‘Of particular interest was the one from Manchester wood letter manufacturer Benjamin Brierly from 1868’ says Barnes, who also looked at the style of the ‘simple numbers’ on England’s 1966 shirts ‘which were not dissimilar in style to the Brierly specimen’. 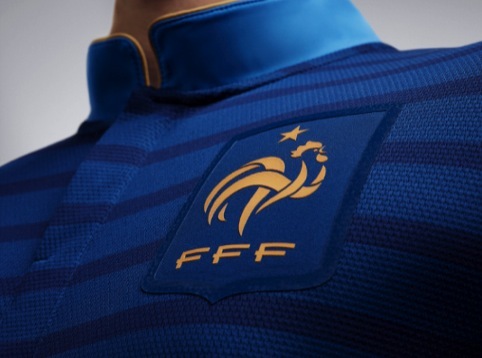 French kits of old were blue and white, so this military-uniform-inspired design by Nike is a marked departure and uses a thinly striped, mariniere pattern comprising Meteor Blue and Pacific Blue. The high-collar shirt is finished with gold piping and on the cuff of both sleeves is a hexagon set in three tones of gold, in tribute to the Tricolore national flag. A red strip in the neck lining reads ‘Nos differences nous unissent’ (Our difference unites us), a nod to French cultural diversity. 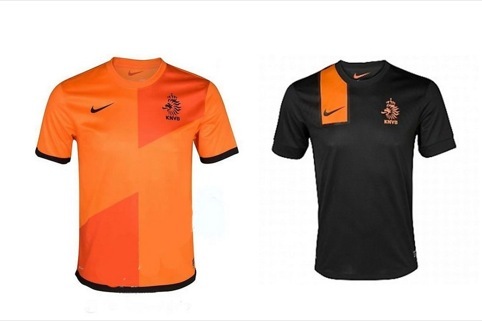 Nike claims that its kits use shorts made from 100 per cent recycled polyester and shirts, from 96 per cent polyester. 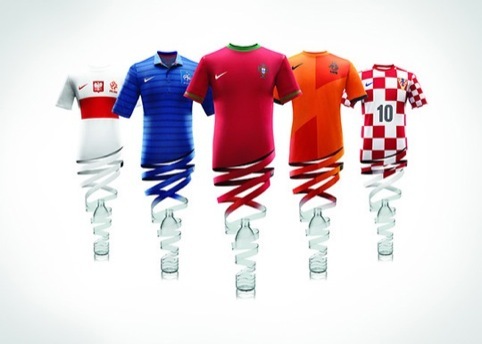 Thirteen recycled plastic bottles go into each kit, says Nike, as demonstrated in this otherwise baffling picture. 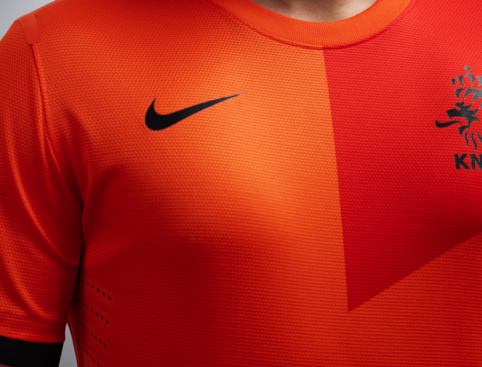 The Dutch kit, also designed by Nike, uses a diamond effect to mimic a sash, which featured on the country’s first kit in 1904. Another graphic has been used in the neck lining by the manufacturer, this time inscribed ‘Nieuwe Meesters’ (New Masters) which is an optimistic analogy, linking a Dutch 17th century artistic movement, to the Netherlands’ bright young things on the pitch. And their older players. 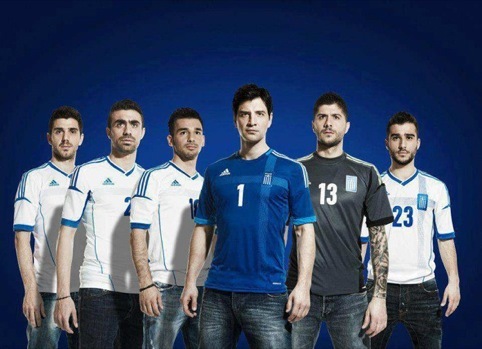 The new Greece kit – modeled here with denim and furrowed brows – is designed by Adidas. The white shirt is the home variation and borrows the colours and cross from the Greek flag, placing the team’s crest where the lines meet. Along with the various Adidas branding, that’s a lot of stripes. The design approach was exactly the same to that of Meran by the sound of it but with more of an old-fashioned blackletter feel. 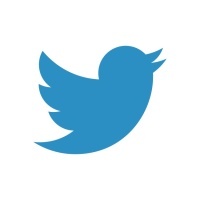 Definitely one of the more interesting types used in euro2012 though.